The curved stuff sounds like a stupid gimmick for sure, a curved screen works if its 80 ft wide and curved, at 50 inches and curved, seems like youd have to be sitting a foot away from it to get the same effect. Probably I am wrong but sometimes when after I watched my video and switch to TV broadcast, I cannot understand why my recording is not beautiful like TV broadcasting, even though I used 1920x1080p AVCHD FX mode to record. So 4K camera will be the answer to my question. I am not happy with the current HD camera resolution when I watching the TV pro shot video. Professional have the best sensors and lenses, that's why their work looks better and why owner/operators charge a thousand+ for a 10 hour day, including an audio assist. At a 1000, you are getting a deal. Day rate for camera operator alone is $400 or so in Seattle, add in an audio assistant $350. To get camera rental, audio recorder, mics, etc for $250 on a single day rental is a steal. Rule of thumb is your weekly rental price is 10% of new, and with the standard 3 day price for a week rental, the $250 would get you 7500 in gear. We know how little that is when you talk about pro gear. By our standards a pro record package would be 2-4,000 and a camera can go much higher. Hell the lens alone can go higher. So.... Over a year since this topic was made. Who is shooting 4k now? A buddy of mine just told me that 1hour of 4K video = approx. 64GB. My Panasonic FZ1000 starts a new file approx. every 6 min and each file is 3.97GB. obvious for me and low light shooting is phenomenal even rezzed down to 1080 it is better then the 1080 my HX20V shot. Was curious if you shoot any video with your Canon Dslr with 300 2.8. Panasonic has a 1 inch sensor while the sony photocam has a much smaller sensor. I wouldn't buy a new camera that didn't shoot 4K because the extra resolution lets me do a lot of cropping and panning in post. I use a 720p timeline so I can crop 3 to 1 without taking a hit in the final render. This can mean shooting a duo then moving between them in post, or shooting a player and doing a zoom to the guitar neck or face without losing quality. It also means I can be looser with my framing and tighten up in post without getting fuzzy. The panning is nice and can be an advantage of 4k. However, a 720p timeline is not something I prefer. I shoot in 1080p so I keep the timeline 1080p. Being able to be looser with the framing wouldnt be an advantage to me either. I'd rather have a good shot straight away instead of to tighten it all up afterwards. Editing is not really something I enjoy doing. It's just a job that needs to be done. The less time I spend editing, the better. I was toying with the idea of getting a Canon G20 camcorder, but now I've seen this for a little bit cheaper, I'm kind of intrigued. How long can you shoot with the battery? And what was your set up for recording those samples you posted? Tripod? Handheld? I've recorded with a DSLR before and found it uncomfortable compare to a camcorder, I guess a tripod is the way to go but it's not always possible in small bars / clubs that I usually frequent due to limited space. Does this camera have the 30 minute recording limit? Also, I tend to record a lot of punk bands, short fast sets, quick changes between bands on stage etc, and at times have been caught off guard, how good is the cameras auto setting? When I haven't really had time to set my old camcorder up in the past, auto has been my friend just so I'd get SOMETHING. So i finally bought this camera,FDR AX 100. The XAVC S 1080 @ 50MBPS is outstanding. So i finally bought this camera, FDR AX 100. I shot a half hour or so of family picnic activities with my FDR AX-100 this past weekend at a river park that had me going back and forth between shaded and sunny scenes. I was experimenting with adjusting the focus manually with my middle finger and at the same time, adjusting the iris / gain / shutter speed roller with my thumb. Operating the focus, lighting, and zoom all at the same time takes a bit of getting used to, but I foresee getting some really outstanding concert shots this way that are well focused and properly lit - even in situations where the lighting is challenging. Yep,i have focus peakinv set to red medium and is a huge help.Use the My button function you can set three on lcd screen virtual buttons,i have peaking set and white balance and steadyshot at the moment. And then did a little test where I fully charged the new battery and shot video at the highest quality setting (UHD 4K XAVC S 3840 x 2160p / 30 fps / LPCM audio) until either the card filled up or the battery ran out of power. The battery ran out of power before the card filled up. So I then filled up the card using the OEM Sony battery that came with the videocam. So at the highest quality setting, I was able to fit 3 hrs 2 mins and 20 secs of video on the 128GB Sony card. Note: even though the camera stopped at the point where the battery ran out of power, the first file was unaffected and plays all the way through to the end (using VLC on my computer). I got the Wasabi Power BTR-FV100-JWP battery (replacement for Sony NP-FV100 - which costs $124.00 at Amazon) for $15.69 & free shipping at Amazon. 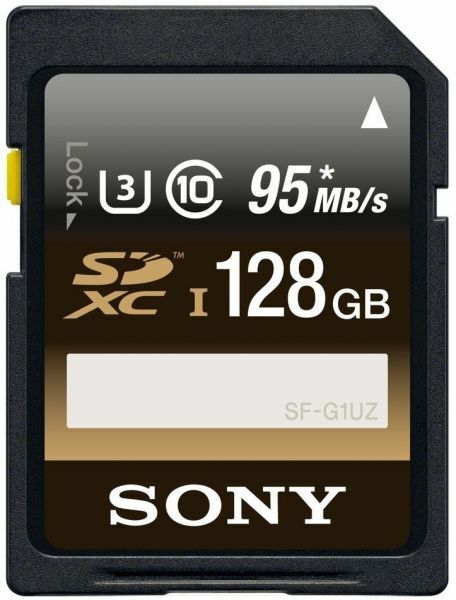 I got the 128GB Sony card for $64.99 & free shipping at Amazon. This was a static video shot with no moving objects in the picture, no zooming, or any other activities that would decrease the life of the battery. Page created in 0.398 seconds with 57 queries.